I recently checked out what might be the slowest construction project Universal is currently working on, the Hello Kitty store and experience at Universal Studios Florida. Rumors had this opening back at Christmas late last year, but here we are in month two of 2016 and not much progress can be seen. When I visited today I did get some confirmation that I did not have before, that Betty Boop will in fact be coming back to her original location when the building is done being refreshed. This is something I suspected, but didn’t have proof of until now. Besides the fact that a couple of employees have confirmed it for me, you can see on the awnings for the shop, (as well as some text visible through a window,) that the black and white beauty will be re-claiming her “largest selection of Betty Boop merchandise in the world” location once again. 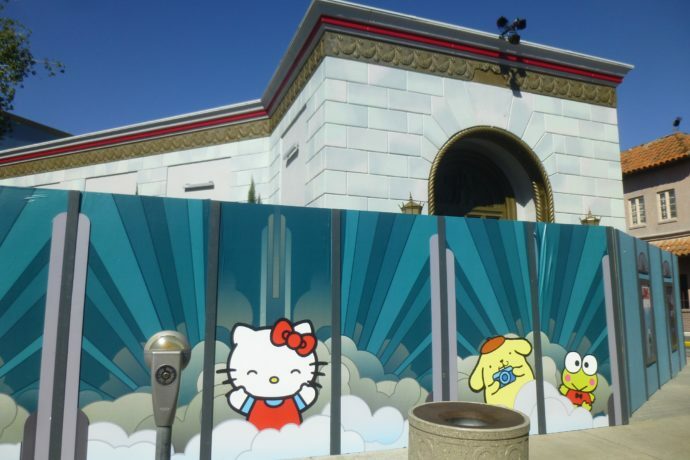 I find this surprising, as it only allows the portion of the building that used to house Lucy: A Tribute to be used for the new Hello Kitty store and meet & greet areas. It’s not that small a space, but considering how much Sanrio branded merchandise exists in the world, I find it somewhat shocking how small a space they’ll be allocating for it. They could fill the entire main Studio Store with Sanrio twice over and still not run out of Hello Kitty and friends branded merch. Perhaps we’ll see products with the famous Kitty in more stores throughout the parks as well. Check out the photo update below and stay tuned this week and next for more theme park updates! Thought it was strange Betty Boop was on walls around Hello Kitty store. Turns out she’s coming back! That’s all for this update. They’ll be more Universal updates this week, and check back next week for Kong and Hulk coverage at Islands of Adventure, so stay tuned.